Connacht’s head coach heaped praise on Nigel Carolan’s attack along with the ‘immense skill-set’ of Jack Carty. THERE WAS SOMETHING brilliantly familiar about the roar that greeted Niyi Adeolokun’s match-sealing try against Scarlets on Saturday evening. As the wing tore away from the right towards the posts, the Connacht bench scattered, fists filled the air over the Clan Terrace and an almighty roar went up before the deceptive six-point lead turned to the final score of 33-20. Rugby fans west of the Shannon have not been entirely starved of impressive wins or entertainment since the departure of title-winning coach Pat Lam and this week the 47-10 thumping of Leinster (or John Muldoon Day) will be front and centre of memory banks on both sides of the island. 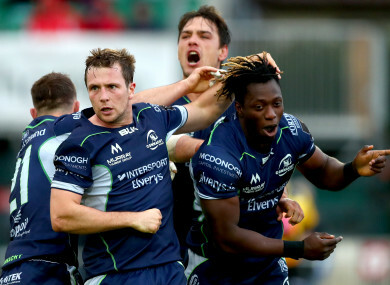 However, victory over Scarlets felt like a return to a consistent, coherent Connacht approach, and with that the link with supporters is strengthened. There are flashes of Connacht’s brilliant 2016 attacking prowess, but also unmistakable tweaks and adaptations. For one, they kick the ball. Here they intelligently twisted the knife on Scarlets and penned them into their own half for long stretches of the second half. It was in the first half that the scoring damage was done on Wayne Pivac’s 2017 title-winners with Bundee Aki brilliantly setting up Tom Farrell and the width created by Jack Carty leading to Cian Kelleher haring at the line. All that, Friend insisted post-match, is inherited as he deflected the limelight to Nigel Carolan and defence coach Peter Wilkins. “We have got a great attacking system, we have got a very good defensive system. They are actually not my systems. They are Nigel Carolan’s attack system and Pete Wilkins’ defence system, and owned by the team as well,” says the Australian. It may look like I’ve come in with a magic wand, I haven’t. I have come in and backed people and said: ‘just go do what you do’. They are doing it. Game five brings tougher opposition again to Galway. Leinster will happily show the scar of April’s defeat and hit the M6 in far more determined mood than last season. “I probably learned this week what that is all about,” Friend said with a wry smile when asked about his first taste of inter-pro action. “Having watched it previously, even from home, you know that the four provinces when they play they are all very very proud of their respective areas. A hazy minute or two after that relationship between team and crowd came to the boil with a third try, it showed itself in a less reflexive way when a roar almost as loud, but with more warmth and pride than triumph greeted Carty as the out-half was called ashore. Seven kicks from seven off the tee only speaks for a small part of the Roscommon man’s game. His fluid, varied passing stretched the Welsh side and his kicking game continually turned them to face back to the starting point. Showcasing his entire arsenal in his fourth straight start this season, Carty looked at his most comfortable. “He’s got a skill-set that’s quite immense,” Friend offers after Carty heaped praise on others for his own performance. He can pass off both sides, kick off both sides, he can turn opposition and if you leave him alone to it he’s a running threat. We’re starting to see that with him and long may it continue. Just as there is almost tangible connective tissue between this team and its supporters, Carty links back to his head coach when explaining Saturday’s exceptional performance. The 10 is, of course, also aware that his confidence to play the game as he sees it is built on a platform created by his team-mates. The pack, naturally, but also a back-line that continually presents a conundrum of angles and depth for defensive lines to figure out. “Our forwards are ferocious in their carries and what that does for me is it puts the defence on the back foot. You’re getting on top on the inside shoulder and they’re blasting each other through. When you have defences retreating it gives the nines and 10s extra space. “When we do that our short side is reloading and it opens up space in the backs. What’s really positive for us is our talk and the ferocity of our carries has been really good. “When you look back at that game there, when we were in the game a lot of the talk when we came in together is that they were filling the pitch, but they were shooting past the ball. When you have that sometimes the space isn’t there on the edge. “We brought it in and said to just keep playing through them. Our forwards gave us a good platform to get us into the middle. Then when we got to the middle it gave us spaces on the edges. Email “'They're not my systems': Friend hails Carty and assistants as Connacht click”. Feedback on “'They're not my systems': Friend hails Carty and assistants as Connacht click”.